Remember the Asian Festival? Well ever since then I have been craving ZenCha's okonomiyaki. I'd watched them make it and the ingredients are pretty basic. You can use pancake mix, but where's the fun in that? 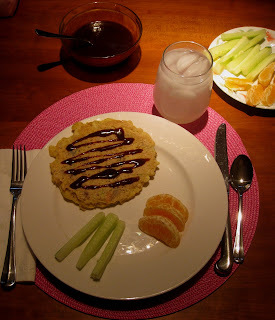 So I hopped on the internet and Googled "okonomiyaki" and got quite a few hits...some of which I couldn't read because my Japanese is a little rusty (um, as in nonexistent!). So I printed off one of the recipes and I was off and running. And if I'm cooking Japanese, don't I need to look the part? "Yes I do!" is the resounding answer!!! 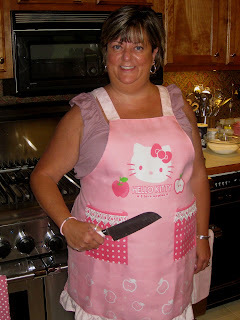 So I donned my "Hello Kitty" apron and transformed into "Chef Hello Kitty"! With my pink handled santoku I could tackle anything! Even okonomiyaki! So with my dear husband Robert-san, we began to assemble ingredients. The recipe called for bacon and prawns, but that seemed odd. 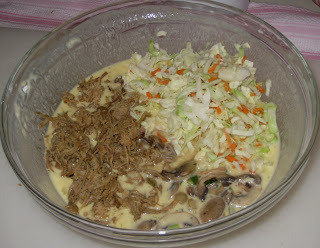 Laura had simply used shredded cabbage and chicken in hers. Now in reading the many recipes that popped up, one of the great things about this dish is that you can use bits of leftovers that you might have. I had some button mushrooms and I also had some pulled pork. 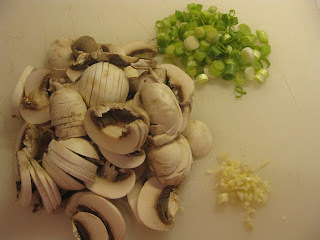 The recipe called for sliced scallions-okay, had those too. I figured I'd throw in a bit of minced garlic simply because there are very few things that Robert-san and I cook that don't involve garlic. That's just how we roll in this house. 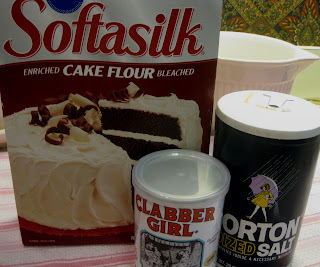 So we begin with baking powder, cake flour and salt. It said to "sift" but I "whisked". I like to live life on the edge like that sometimes. 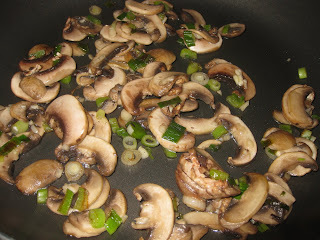 So with my pink santoku flying like the speed of light...or not...I sliced mushrooms, sliced scallions, and minced garlic. Next we put some peanut oil, oh I'd say about 1 & 1/2 teaspoons, into a skillet (yes, it is pink) and warmed that baby on medium high heat. I wanted to use as little oil as possible. Then Robert-san sauteed the vegetables. Just enough. Not too much. Ya gotta crack some eggs if you're gonna make okonomiyaki! Gotta whisk 'em up, too! After you get them all mixed up, the recipe tells you to add the water to the dry ingredients. I didn't add it all in at once because I wanted to watch the consistency. But then I realized you'd be adding more liquid, i.e. eggs. 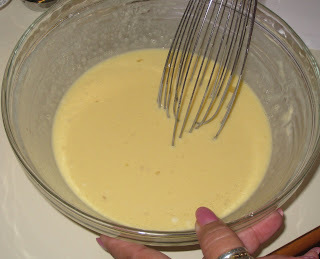 So, next time I would add the eggs first, then add enough water to get the batter just right. As it was, I think I had it a little too thin. Next came the cabbage and pork. 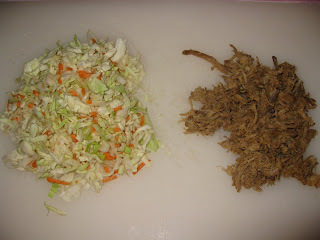 The cabbage I used was pre-shredded slaw mix. Carrots and cabbage. I chopped it up just a bit because there were some very looooooooong strands of cabbage in there. This is the shredded pork that I had. Now, here I will tell you something that both of us decided as we ate the finished product. We think it would have been better to have meat that had been grilled. I think the shredded pork just didn't have enough flavor to really stand out and make this as good as it could have been. 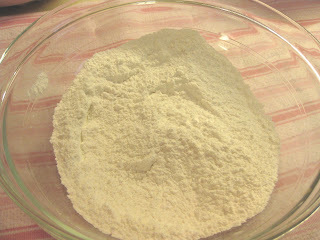 Then it was time to dump it all in the batter. Yipee!!! Stir it just until combined. At this point I handed off to Robert-san. 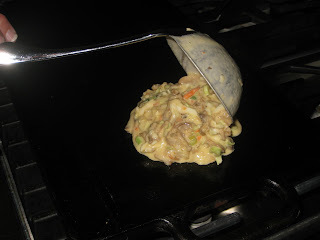 He had the cast iron griddle screaming hot, awaiting the batter that soon would be dinner :-) He ladled it onto the hot griddle. 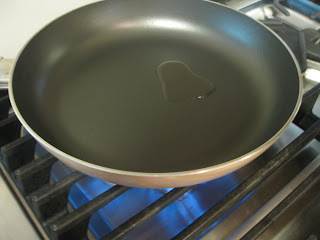 I tell you, this guy is a wizard at making pancakes on a Saturday morning, so I just knew he was the man for the task! While the okies were cooking, I assembled the ingredients for the sauce. 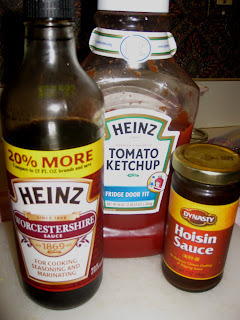 I wasn't using the sauce that is shown with the original recipe. The measurements for what I was making were a little difficult to decipher, so I just kind of winged it. I tasted and added and tasted and added until I got to what I remembered was pretty similar to what we'd had before. Except...it was lacking that little "something". 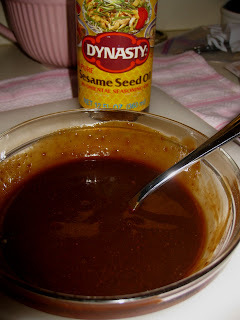 So I drizzled in just a tad of sesame oil (oh my gosh I could bathe in this stuff) and that did the trick. Almost. I think I was a little heavy handed with the worcestershire sauce, and unfortunately ya can't go back. We both agreed that it was not the best dinner we've ever made, but most certainly not the worst. We will make a few changes next time we make it. And we both agreed we will make it again. It's worth a "do-over". I think we'll add more than one clove of garlic. We really couldn't taste it. And as I mentioned, we'll use a more flavorful meat, probably grilled. 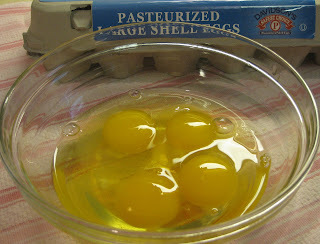 And I got the batter too thin so I'll add the eggs first and then the water. Or hell, I'll just use the darn pancake mix! I had quadrupled it because subconciously I must have been thinking I was feeding the entire neighborhood! The recipe states it is for one pancake. I guess I assumed they were little. But as you can see, they were quite large. 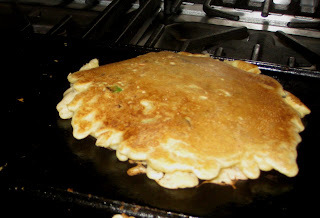 And that was the one pancake, as we got four out of what we made! If you're feeling adventurous give it a try. It's not exotic or anything. Actually, it is kind of a comfort food thang! Now if you'll excuse me, I got Martha's new cupcake cookbook today. And I am just aching to dive into it! Cupcakes, here I come!!! I LOVE the HK apron.. I think if everyone looks back at my Semi Homemade post you can see my very Japanese apron as well. :P It sounds like you guys had fun with this and that is the best part of experimenting with stuff! Yum! Very excited that you posted this recipe. A place I frequent serves japanese "pancakes" and this is so similar! Will definitely try!